The Triumph of the Virtue (also known as 'Minerva Chases the Vices from the Garden of Virtue') is a painting by the Italian Renaissance painter Andrea Mantegna, executed in 1502. It is housed in the Musée du Louvre of Paris. The triumph was the second picture painted by Mantegna for Isabella d'Este's studiolo (cabinet), after the Parnassus of 1497. It portrays a marsh enclosed by a tall fence, ruled over by the Vices, portrayed as hideous figures and identified by scrolls in a typically medieval way. Idleness is chased by Minerva, who is also rescuing Diana, goddess of chastity, from being raped by a Centaur, symbol of concupiscence. Next to Minerva is a tree with human features. High in the sky are the three theological virtues: Faith, Hope, and Charity. In the spring of 1460, following the installation of the San Zeno Altarpiece in Verona, Andrea Mantegna finally decided to accept the invitation offered some four years earlier by the Marquis Ludovico Gonzaga of Mantua. From then until his death in 1506, Mantegna would serve as the official court painter of the Gonzagas, working successively under Ludovico (1444-1478), Federico (1478-1484), Francesco II (1484-1519) and the latter's demanding Ferrara-born wife Isabella d'Este (1474-1539). His first major commission was the decoration of the chapel of the Castello di San Giorgio, adjacent to the ducal palace, which Ludovico had adopted as his residence in 1458. Mantegna designed the ornamentation of the painted panels and the woodwork encrusted with precious stones, as well as the architecture. Unfortunately, drastic alterations made during the Cinquecento largely disfigured this masterpiece. It has been suggested that certain elements of this decoration project could be discerned in several esteemed paintings: the Adoration of the Magi, the Circumcision and the Ascension, today in the Uffizi Gallery, the Death of the Virgin in Madrid, and the Christ with the Virgin's Soul in Ferrara. These paintings are remarkable for their accuracy worthy of a miniaturist. However, despite the monumental spectacle on view in these works, particularly in the Circumcision, it is also important to recognize the lyrical realism that emanates from certain details such as the scalpel, the pouting child or, in the Death of the Virgin, the landscape in the background with the view of the lake of Mantua. Mantegna's masterpiece of the Mantua period, nine years in the making, occupying the artist from 1465 to 1474, is the series of frescoes covering the walls of what is known today as the Camera degli Sposi (The Spouses' Room) representing the various members of the Gonzaga family busy with their daily tasks. With this work, Mantegna reached the pinnacle of his illusionist creativity: the painted oculus on the ceiling, bringing to mind a great circular opening to the sky, with clouds floating by, lends a three-dimensional quality to the figures depicted. Typically dated from about 1470-1475, the Saint Sebastian in Vienna has Mantegna giving free rein to his passion for epigraphy, inscribing his signature in the stone in Greek letters. We also note in this work an anthropomorphic cloud--an innovation that also surfaces in the ceiling of the Camera degli Sposi and the Minerva in the Louvre. 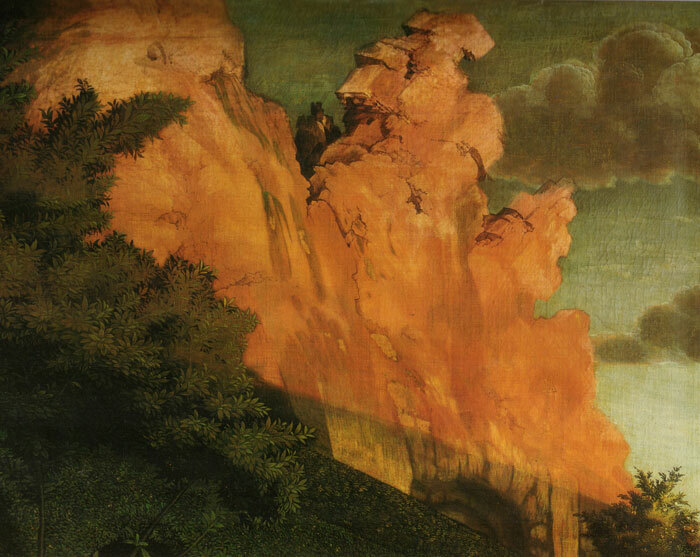 These symbolic details, combined with the morbid dignity suffusing the face of the saint in agony, made this painting and its creator a beacon for the international culture of decadence of the late 19th century. Mauro Lucco, ed (2006). Mantegna a Mantova 1460-1506. Milan: Skira. Andreas Mantegna is one of the greatest of the Italian Renaissance Artists. A virtuoso, who was deeply inspired by Classical Art and Literature, he was highly skilled in Foreshortening, Perspective, and creating magnificent visual illusions that draw the viewer in to participate in the painted scene. Born in 1431 in the North Italian village of Isola di Carturo, Andreas Mantegna was the son of a carpenter called Bagio. It was usual then for sons to follow their father's trade, but Mantegna's talent must have become apparent at a very young age and he was earmarked for an artistic career. 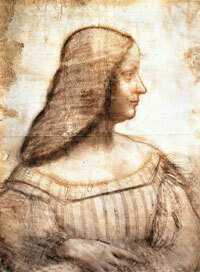 When he was ten, he came to the notice of Francisco Squarcione, an artist from Padua, and was formally adopted by him. 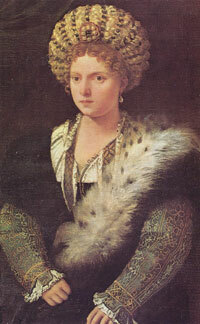 Francesco Squarcione had several other adopted sons. His motive was not a fondness of children, but a cold, business-minded outlook. He took in talented youngsters, put them to work on art projects undertaken by his Studio, and kept their earnings. Life with Squarcione was not easy. Mantegna was too bright not to realize he was being exploited and was already too much of a forceful personality to take it lying down for long. 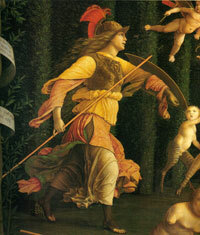 They had plenty of bitter squabbles and finally, when Mantegna was seventeen, ended up in court to have the legal adoption rescinded. This enabled Mantegna to keep all the money he earned and move on to better prospects. Still, the years spent in Squarcione's studio provided Mantegna with valuable training and also exposure to the culturally rich atmosphere of Padua. This famous University town attracted intellectuals, artists, and writers from around Italy and beyond, all converging to work, learn and exchange ideas. Living in this exciting hub had a profound effect on young Mantegna. At the time, there was considerable revived interest in the antiquities of Ancient Rome and Greece, and many of these statues and paintings found their way to Padua where Mantegna saw them and fell immediately under their spell. His interest in classical antiquities was to be a life-long one. He preferred studying classical statues to observing from nature, a habit that Squarcione greatly derided. 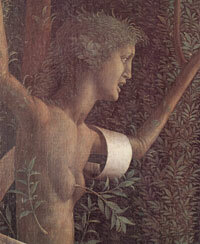 According to him, this made Mantegna's figures appear hard and lifeless, like they were made of marble. It seems this criticism really stung Mantegna, and much later, when he painted the famous painting 'St. Sebastian', he painted a marble sculpted foot beside the Saint's flesh and blood foot, and we can see for ourselves the non-validity of Squarcione's assertions. Aside from his passion for the art of the ancient world, Mantegna was greatly influenced by the works of Jacopo Bellini and his sons Gentile and Giovanni Bellini, Rogier van der Weyden, Piero della Francesca, Paolo Uccello, and Donatello. Mantegna really came out on his own as an artist after splitting with Squarcione. Shortly afterwards, he was given the very important commission of working on frescoes for the Ovetari Family Chapel in the Eremitani Church. The project initially included three other older artists, but they dropped out one after the other, and, in the end, it was Mantegna alone that completed the work. The Eremitani Fresco Series, completed in 1457 and showing an extraordinary grasp of perspective and composition, included the works 'Baptism of Hermogenes', 'St. James before Herod Agrippa', 'St. James Led to Execution', and 'Matyrdom of St. James'. These masterpieces were destroyed during the Second World War, when American bombs, as usual, got the wrong target – the Eremitani Church instead of the Padua Railway Yards. Mantegna next worked on the 'Cruxifixion' altarpiece for the Church of San Zeno. Around this time, Mantegna got married to Jacopo Bellini's daughter Niccolosia and was offered the prestigious position of Court Artist to Lodovico Gonzaga II, the Marquis of Mantua. After much deliberation and hesitation, Mantegna accepted and, except for a brief stay in Rome to work for Pope Innocent VIII, remained in the service of the Mantuan Court for the rest of his life. Mantegna really flourished in Mantua. Although he could be a rather temperamental and problematic individual, Lodovico and his successors, Frederico and Gianfrancesco, always held him in the very highest esteem, and, well paid, he was able at last to indulge in his passion for collecting classical antiquities. He built up quite a collection, and, well inspired, painted some of his best works here, trying out his hand at everything from religious altarpieces and frescoes to purely allegorical paintings. Some notable mentions are his panels for the Gonzaga Castle Chapel - 'Adoration of the Magi', 'Ascension', and 'Circumcision'. Two study trips to Florence inspired him to paint the famously foreshortened 'Dead Christ', a remarkable work that leads one to be somewhat prepared for the grand ceiling illusion of the 'Camera degli Sposi'. 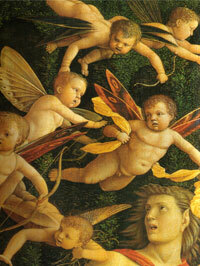 This fresco, finished in 1474, gives the impression of a very high ceiling with circular sky opening, from which Court Ladies, Putti and even a peacock look back down at us; there is a heavy tub of plants balanced rather precariously overhead on a rod, all set to tumble down on Mantegna's critics, no doubt. Other remarkable paintings of this period include 'Lodovico Gonzaga, his Family and Court' and 'Servants with Horse and Dog', both works giving us an insight into the life at the Mantuan Court. After this success, came the 'Triumph of Caesar' series, a body of work that Mantegna himself considered the high point of his career. It was while he was painting these series that he was summoned, in 1488, by the Pope to Rome. He remained two years to paint a chapel that was, unfortunately, destroyed in 1780. On his return to Mantua, where the Court was now dominated by Gianfrancesco Gonzaga's new and intellectually brilliant wife Isabelle d'Este, he was asked to paint the mythological paintings ''Parnassus' and 'The Triumph of Virtue' for her study. He also painted many sculpture-like monochrome works like 'Samson and Delilah' and 'Introduction of the Cult of Cybele into Rome'. In his last years, Mantegna was troubled by financial concerns and was forced to sell some of his Classical collection to Isabelle d'Este; most heart-breakingly of all, his beloved Roman bust of the Empress Faustina. A few weeks later, on 13 September 1506, Mantegna died at the age of 75. This page uses material from the Wikipedia articles Andrea Mantegna and Triumph of the Virtues (Mantegna), published under the GNU Free Documentation License. Wikimedia Commons has media related to: Andrea Mantegna and Trionfo della Virtù. The fashion of studioli, or private studies, small rooms reserved for intellectual activities, spread in the 15th century in the Italian courts, bathed in Humanist culture. Isabella d’Este, who married Francesco II in 1490, rapidly decided to create a studiolo in a tower of the old Castello di San Giorgio. The work on this project lasted more than twenty years. She entrusted Mantegna with the first two canvases of the cycle, Parnassus (1497) and Minerva (1502), but considering his work out-of-date, she turned to the most famous painters of the new generation. In vain she solicited Giovanni Bellini, Leonardo da Vinci and Francesco Francia but, in 1505, she obtained only the disappointing painting by Perugino. Lorenzo Costa, appointed court painter at Mantegna’s death (1506), completed the decoration with two canvases delivered between 1506 and 1511. The Parnassus and Minerva were painted by Mantegna to be placed opposite each other, as demonstrated by the fact that the light comes from the left in the first painting and from the right in the second. A year after her husband’s death (1519), Isabella transferred her studiolo to the ground floor of the Corte Vecchia. In her new apartment, she added two Allegories executed circa 1530 by Correggio to the old series of paintings. The layout of the exhibition, while inverting the direction of the itinerary, reproduces the exact layout of Isabella’s second studiolo. The five canvases of the first Studiolo, in the Castello di San Giorgio, all treat the theme of the Victory of Virtues over Vices, but we ignore whether they were part of a general iconographical program fixed from the beginning. The first picture, commissioned by the Marchesa and completed in 1497, already contains in embryonic form the themes to be developed in the other paintings, namely the triumph of spiritual over earthly love and the celebration of the Arts at the Court of Mantua. The evocation of the amorous relationship of Mars and Venus could be interpreted as an allusion to the couple formed by Francesco II and Isabella, patron and protector of the Muses. 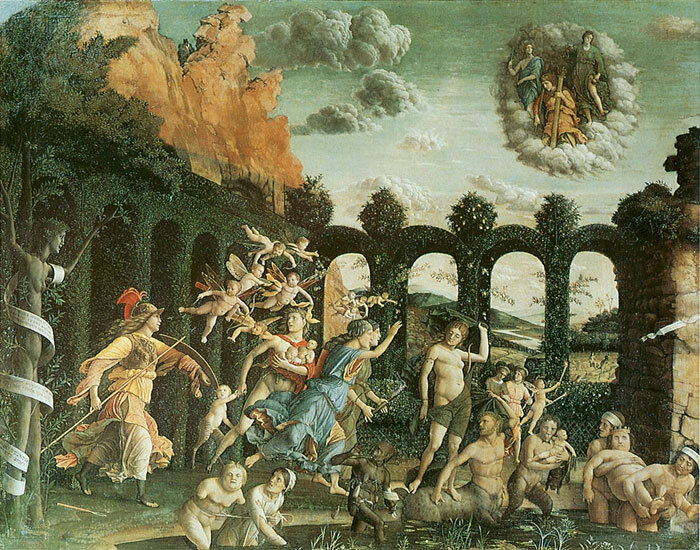 The fact that the second painting, Minerva Expelling the Vices from the Garden of Virtue, completed in 1502, contains ideas and motifs that had obsessed the artist from his beginnings, nonetheless leads one to consider that the artist played a determining role in its conception: the theme of Ignorance as enemy of Virtue, numerous inscriptions in different alphabets, clouds and a tree in human form, or the grotesque personifications of the Vices, chased by the dynamic and majestic warrior goddess.